A month of big events drew a higher than usual proportion of users to the BBC iPlayer's live streams. Events such as the One Love Manchester benefit concert, the general election and Glastonbury festival caused a spike in the number users accessing live streams during June. In total, 21% of requests to the BBC iPlayer were for live TV viewing, the highest since last year's Rio Olympics. One Love Manchester was the most popular programme of the month, with over 2 million requests for the concert. The start of the BBC’s general election coverage, which saw David Dimbleby unveil the exit poll, saw the second highest level of requests in June, with 1.3 million requests. 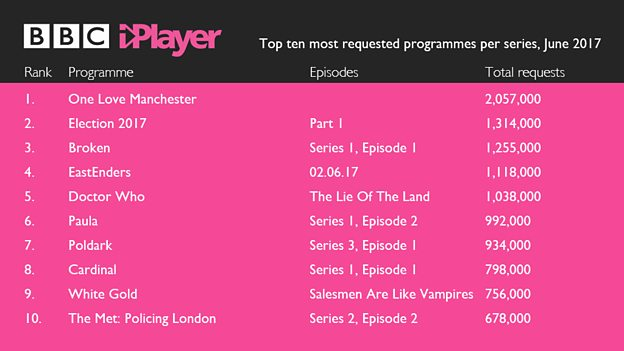 June saw 256 million requests to BBC iPlayer in total, a 12 per cent increase on the same month in 2016. Outside of live viewing, Sean Bean drama Broken was the best performing show, with over 1.2 million requests. New drama Paula performed well with 992,000 requests, and the return of Poldark also proved popular, with over 934,000 requests. During June, the iPlayer began to make sign-in mandatory across a number of devices.